The 2006 data reported in this memo come from a survey conducted by Princeton Survey Research Associates International between August 1, 2006 and August 31, 2006. 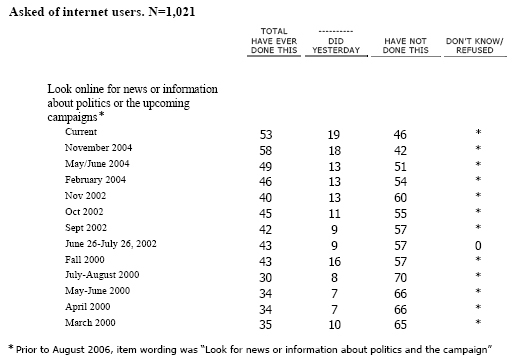 For results based adult internet users (n=1,021), the margin of sampling error is plus or minus 3.5 percentage points. The November 2004 data is based on a survey of 2,200 Americans; the July 2002 data is based on a survey of 2,501 Americans. The sample for the surveys is a random digit sample of telephone numbers selected from telephone exchanges in the continental United States. The random digit aspect of the sample is used to avoid “listing” bias and provides representation of both listed and unlisted numbers (including not-yet-listed numbers). The design of the sample achieves this representation by random generation of the last two digits of telephone numbers selected on the basis of their area code, telephone exchange, and bank number. The response rate for the August 2006 survey was 28%.